Hi I just registered. Me and a friend were looking for a friendly server we could join, and I'm wondering if you are still allowing new members. We are very interested in this one seeing as it is a family friendly server. If this is in the wrong spot I will take it down. Welcome to the server. 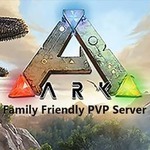 To play on the server simply look for ArkFam.com in the unofficial list if you can't find it simply use the information provided on our website to make a desktop quick launch key. Please make sure you take the time to read over the rules and settings page on this site.